Wow, am I thankful I got these pictures uploaded onto here before my USB drive crashed! Anyways, I'm back... with *sniff* the last *wipes away tear* CCCWATCMM craft that I get to do *sobs*. (CCCWATCMM is Christmas Craft Collab with Awesome, Totally Cool, Magnificent Madison) Maybe we'll get to do another! I've loved every minute of this and I felt so honored when Madi suggested it - the BEST blogger ever! In case you haven't seen the others that we've done, let me show you quickly! 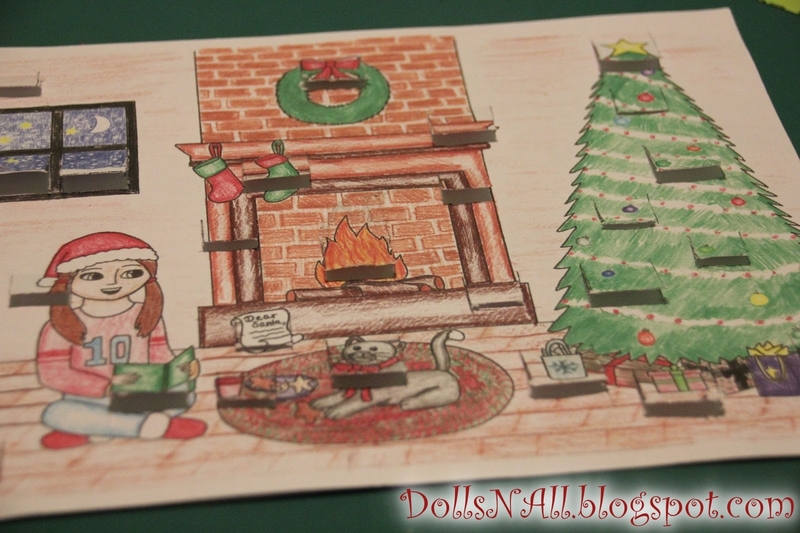 The first craft that we did was here at Dolls N' All, a countdown calendar! The next one, was over at DelightfulWorldofDolls! These adorable Christmas tree ornaments were made by Madison, and I made a few a couple days ago and now they're on my doll tree! 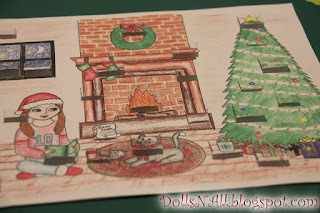 Madison came up with another amazing craft for #3 of the Christmas Craft Collab, Doll Stockings and I have my felt and I'm planning on working on my dolls' soon! 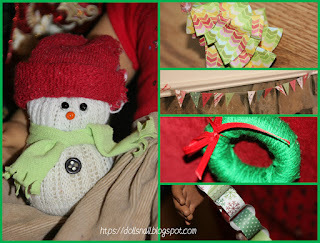 Then it was back over here at DNA on how to make some fun crafts to decorate with! Once again, a brilliant idea for DIY Doll Presents made by Madison! And then I did a DIY No-Sew Mini Doll Cape and Muff! And now, for one more craft - plus an idea on how to use them at the end! Then, for a simple way to do things, write a phrase such as 'Merry Christmas' on another strip and glue it on top. Fun and easy! But there are SO many ways to make cards... so the cards that my dolls made will be examples today! This might spur your creativity and give you some ideas! #1: Find fun paper with a busy print such as this gingerbread man paper. Choose only one thing to emphasize and center it on your page. #2: Here's another example of the one that was step by step (what, like, two steps?!) but it looks very elegant in my personal opinion. #3: This one is really pretty, I think. My dolls took a sticker and cut out the Eiffel Tower, leaving the band at the bottom and top (the black one) and placed it just right on the card. To add some holiday cheer, they made a little green bow and glued it to the top! #4: Kinda like #1, you can emphasize objects on other sheets, cut them out all by themselves, and glue it on the front of the other paper(don't forget that band! Use several fonts when writing!). #6: Once again, emphasizing one snowflake and putting it halfway on that band, but keeping it in the original spot. #7: This one might just be my favorite: glitter foam sheets! 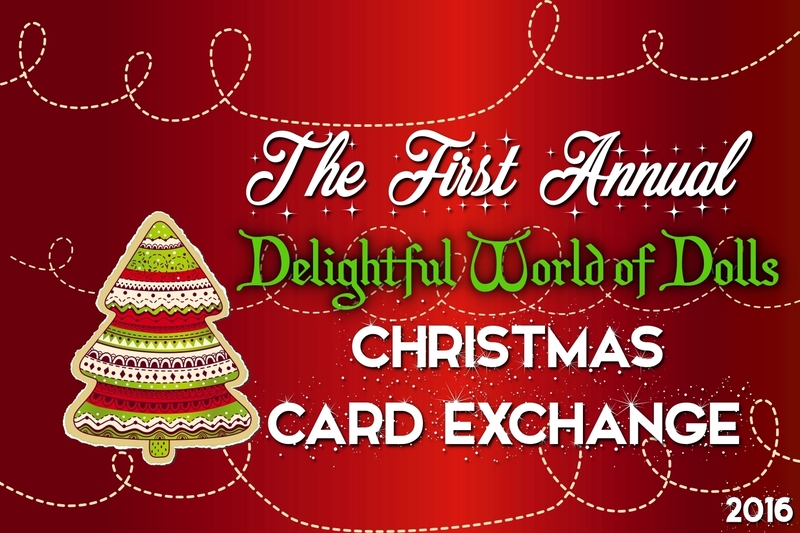 Cut a strip of paper wide enough to fit the card and 2 and 1/3 the size of the card. Fold the bottom up and tape it, slide the card inside, and turn the flap down. Easy. See that? That's a sneak peek at my suggestion at the end of this post - but don't scroll yet! I have some photos of some of the dolls and the cards they made before sending them off! Julie was very proud of her card that she made! Yes, hers was the glittery one, what else? Josie, the baker, chose gingerbread as her theme. Samantha actually typed her banner of 'Merry Christmas' on a real typewriter! And when she finally got a little more serious, she balanced her card on her head. Elizabeth's was a very elegant card with the snowflakes. Madison and her dolls over at DWOD! You see, Madison is hosting a Christmas Card Exchange and each of my dolls (plus Grace, because Madi is one doll ahead of me!) chose one of hers to send a card to! Can you guess who sent it to whom? I'd love to see them and feature them in a post on Christmas Eve! Which card was your favorite that I made? Cute! I love them! Merry Christmas! I'm glad you like them! Merry Christmas to you too! I thought you might like this one! ;) My dolls had a ton of fun making them! That's a great idea! 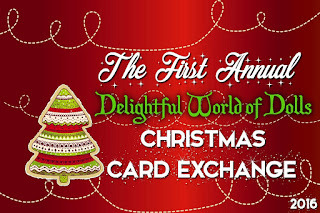 Have you gotten my card yet (probably not, I just sent it on Saturday :()? My dolls can't wait to get theirs! You're welcome, as always! Those are cute ! Also Katie is funny ! Thanks, Katie! I wonder why it's your favorite... :D It IS a Christmas tree cookie on the front after all!